1. 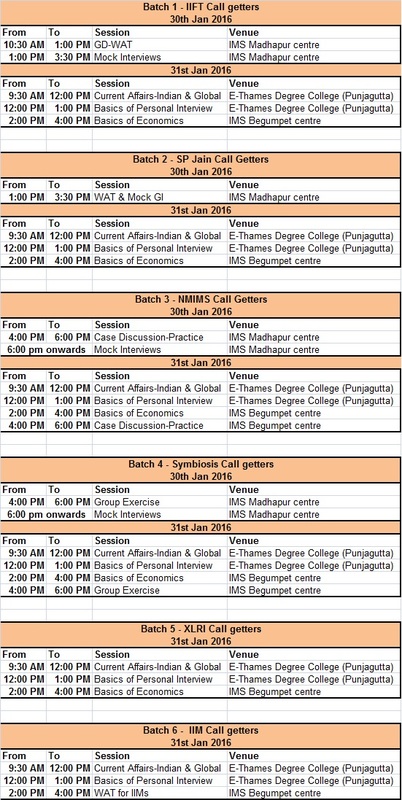 Students should attend the sessions in the respective batch of the B School they have received the call from. Students with calls from multiple B Schools as per the batches above can contact the respective centre they have enrolled with for details. 2. Mock Interviews would be scheduled by IMS team for certain students depending on their actual Interview date. Students attending the IIFT, SP Jain & Mock PIs should carry the respective Interview form. 3. All the sessions will be handled by B School alumni or Industry experts and hence we strongly suggest each one of you not miss any of the sessions. Kindly reach the venue on time for each of the sessions to ensure best of the support. 4. The schedule mentioned above has been emailed to your id along with the address of the venues. 5. For any queries feel free to contact the below centres on their respective numbers.